Is your dog an overexcited greeter when guests come to visit, or when you come home from work? 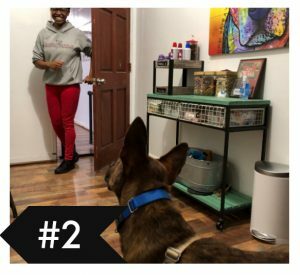 If you LOVE that your dog is happy to see you and your visitors, but wish they were a little more calm and polite, try one of our favorite, simple solutions to reduce entryway shenanigans: The KONG® Station. Step 1. 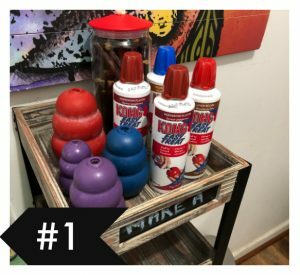 Purchase 4-6* classic KONGS, or similar stuff-able food toys, along with a couple of cans of Kong stuffing or spray cheese. Step 2. Place the KONGS and stuffing in a basket by your front door, out of your dog’s reach, but easily accessible. Step 3. When you or a guest enters your home, grab a Kong from the basket and spray some filling inside. Step 4. Present the Kong at your dog’s nose level and allow them to lick at the filling for a few seconds. Step 5. 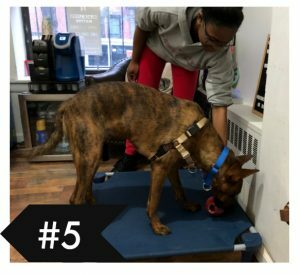 Keeping the Kong at nose level, walk them over to their dog bed or a favorite resting spot, and set the Kong down for them to work on. 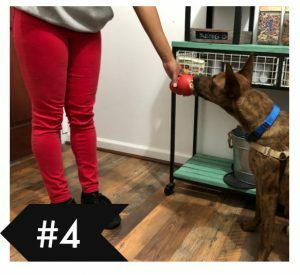 Over time, you can skip Step 4 and just direct your dog to head straight to their bed or resting spot, then give them the Kong. That’s all there is to it! 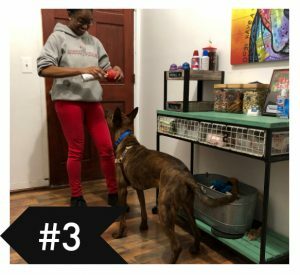 This is an easy, effective, and fun way for your dog to learn to move AWAY from the door when people enter, and to engage themselves in a calm, four-paws-on-the-floor activity instead of jumping. 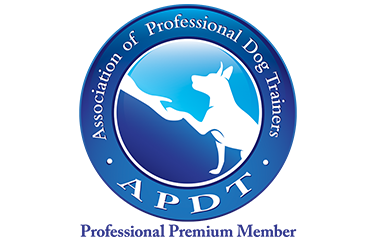 Another great alternative to help with dogs who LOVE to jump to say hello? The Treat Bomb. Learn more about this other simple, effective option here. 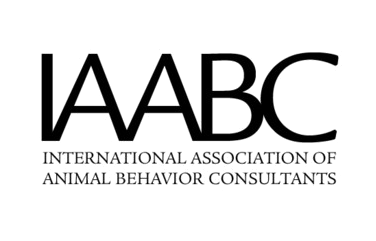 *Why purchase so many Kongs or similar toys for your Kong Station? Because, at any given time, one will be under the couch, one will be in the dishwasher, and one will be in your backyard or your dog’s crate. Having multiples helps ensure that at least one has made its way back to the basket and is available for its intended use.